Dogs. Roald Amundsen sped to the South Pole behind them. Robert Scott couldn’t get them to work. Shackleton’s men, unable to feed them, shot them. Peter Cleary, now Scott Base’s operations manager, took care of Antarctic dog teams and worked with them for three years. One of those years, in the late 1970s, he was at Scott Base. For the other two, in the mid-1980s, he was with the British Antarctic Survey on the Antarctic Peninsula. “My main job was field support,” Cleary said. In 10 summers on the Ice, this is his second season actually stationed at a base. He remembers the dogs fondly. He was the handler for two teams of up to 12 dogs each in the summer of 1978-1979 and the winter of 1979. The dogs were big West Greenland huskies, bred for stamina rather than speed. Though not used as extensively in the late 1980s as they had been in earlier years, Cleary said the dogs were involved in work on the sea ice and in crevasse areas. place. Others, he said, would fall into any hole that happened to be in front of them. In winter, during the few days a month with constant moonlight, running the dogs was easy. In darkness, though, it was tough. Just before Winfly, Cleary would take a team to Cape Royds, partly to get them into condition for the pulling season, but also to check out the sea ice conditions, which were sometimes treacherous. “You can always pull a wet dog out, shake him a bit, and make him run around a while,” Cleary said. Handling dogs was a challenge for Cleary, who had some experience with farm dogs in New Zealand, but considered his work on-the-job training. After three years, he said, “I could consider myself a mildly competent dog handler,” but gave more credit to the dogs than to himself. The dogs, he said, were very much individuals and had to be understood. Notes from previous years’ handlers were helpful, but experience was the real key. It was a chance Robert Scott never gave himself. Dog handling, Cleary said, is a hard thing to learn. Scott was versatile and tried dogs, ponies and motor vehicles. But he had particular problem with the dogs. “They’re not pets and never were,” Cleary said. That was likely part of Scott’s problem. Scott was unable to think of the dogs as workers. Instead, he thought of them as companions on the journey. “If he’d put as much effort into maintaining his dogs as he spent maintaining the ponies, he would have had a lot more success with the dogs,” Cleary said. Cleary had a good measure of success, traveling up to 1,300 miles in a single season, over to White Island, up the Blue Glacier, and to Cape MacKay. But he stresses that those trips were low-key compared to sledging seasons in the heyday of dog teams, which saw multiple journeys of over 2,300 miles throughout the summer. They always wanted to work, which often made for a bit of an exciting start to a trip. slower than vehicles, which wasn’t all bad. “Sometimes you need to slow down around here,” he said. fat content, but killing seals became unpopular. In 1984 at a meeting in Madrid, the countries with Antarctic programs decided to phase out the use of dogs. The British, who had used their dogs very intensively through the early 1970s, didn’t take their dogs out until 1993. Facilities engineers are building two kinds of energy-saving networks around McMurdo Station. One network, of pipes, permits them to heat buildings at little cost. The other network, of wires, lets them centralize monitoring and control of heating systems in buildings around town. Until recently, the power plant’s engines were cooled by giant radiators sitting behind the plant. The energy, called “waste heat,” escaped into the air. Last week, that changed. Rather than transferring excess energy to the outside atmosphere, waste heat is now warming three McMurdo buildings. Facilities engineer Jim McAdam puts it another way: “We’ll do all the cooling of the engines with the town,” he said. water, excess heat from the power plant was part of that process. As well, the water plant has been heated with waste heat since Winfly 1998. The new system came online in Crary and buildings 155 and 165 on Monday night. Eventually, the project will include the science cargo building, the firehouse, the hospital and the dorms. “It went real well,” McAdam said of the changeover to waste heat. It works like this: The water cooling the power plant’s engines will radiate heat to a loop containing a 60-percent glycol, 40-percent water solution. That solution will be pumped to buildings heated with the waste-heat system. loop that can substitute the engines’ waste-heat supply. With waste heat as the main heat source for major buildings around town, boiler emissions will drop by 25 percent and over 450,000 gallons of fuel will be saved each year. “It’s a win-win deal,” McAdam said. The use of waste heat effectively doubles the efficiency of the engines. At present, only 31 percent of the energy put into the machines as fuel emerges as electricity. The remaining 69 percent is emitted in exhaust and radiation from the engine itself (39 percent), and the heat removed by internal engine coolant (30 percent). It is the energy removed by internal coolant that will now be used to heat buildings. The added efficiency of the waste-heat project is enhanced by other heating-system work going on around station. As the engineers install waste-heat equipment in buildings, they are also checking for sources of potential heat loss. Changes to Crary’s heat flow have cut the building’s heating requirements by half. “We’re identifying key heat-wasting points,” McAdam said. Another part of the project, which is also being piloted in Crary, is a remote system by which technicians in the power plant can monitor heating equipment around the station from a computer terminal. Instead of having to go to each building to check equipment and temperatures, automated sensors throughout the new heating system will make those checks continuously. One benefit of the new monitoring system will be a better understanding of how heating problems happen. is too hot because it’s not venting air properly, a repair can be made to the vent rather than to the heat supply. The monitoring system also increases the efficiency of the waste-heat supply system. Along with variable-speed pumps, electronic monitoring permits fast response to changes in demands for heat around town. The project is ahead of schedule. Crary was the only building planned to come online this year, but buildings 155 and 165 are also being added now, rather than next year. “We’ll have the whole project paid for before we finish,” McAdam said. It’s a seven-year plan that will pay for itself in less than three years. “We can put in as much energy as we need and stop wasting so much of it,” McAdam said. McAdam is very proud of the team working with him on all the changes to the heating system around McMurdo. “Those guys have put a lot of heart into this,” McAdam said of the workers who spent the winter on the project. In the next few days, a giant floating bubble will appear over Williams Field and climb high into the heavens. It will circle Antarctica for about two weeks, and return to Earth nearby. The bubble is a helium-filled balloon 100 feet tall. It will carry a scientific payload almost 24 miles into the sky, from which altitude it will still be visible to the unaided eye. The Flare Genesis Experiment, as the project is called, is looking at the origin of solar flares to determine what causes them. What is known at present is that flares emerge from sunspots in which the magnetic field changes, becomes unstable and erupts in a flare. “We want to know how flares are born,” said David Rust of Johns Hopkins University’s Applied Physics Laboratory, the lead scientist on the project. Using the 32-inch solar telescope, the second-largest in the world, Rust and his team can look at sunspots very closely. By measuring the polarization and shifting wavelength of the light emitted from a specific sunspot, Rust and his team can calculate the magnetic field acting on the area. He and others have spent 25 years trying to put together a space mission to do this work. It would cost $800 million, though it would yield years of observing opportunities from a space vehicle. The balloon launch, on the other hand, costs $16 million for about two weeks of observing the sun. The last time the telescope went aloft, in 1997, it stayed up for 18 days. The scientists are supported by the NASA-funded National Scientific Balloon Facility, based in Palestine, Texas. The facility takes care of elements of the project apart from the telescope and its housing. “We provide the vehicle, we provide the telemetry system,” said Steven Peterzen, the NSBF’s on-site coordinator. The facility’s staff also rigs the balloon, performs the launch, monitors the flight, and pops the balloon to end the flight. But even then, the job isn’t done. The payload’s valuable instrumentation must be recovered. which stabilizes over the continent in midsummer. The balloon, when launched from Williams Field, will circle the continent and most likely return nearby, to be brought down on the Ross Ice Shelf for easy recovery. properly, and collect some early data. All data is stored on board for the duration of the flight. the back of an LC-130 and fly closer to the payload, to regain line-of-sight communications. The NSBF team at Williams Field has enough equipment to have the two balloons in the air at once, though that has never happened before in Antarctica. They can only have one at a time in line-of-sight, though, meaning a second launch can follow the first only after a day or two. to launch their project in Antarctica this season. They had hoped to launch in Alaska last June, but were unable to. Then, in August, they got a phone call: Another group wasn’t ready to come to Antarctica. They scrambled to make the trip, helped by the fact that they’d never really unpacked in June. The instruments will show them more about aurora, the ghostly lights in the sky at high latitudes. Aurora are caused by electrons from space entering the Earth’s atmosphere. They release energy in the electrically-charged areas of the upper atmosphere, emitting visible light and X-rays. The balloon’s altitude allows X-rays to be observed before they are absorbed by the atmosphere. The balloon also allows a relatively heavy payload to be launched, as compared with satellites, where weight is at a premium. Further, while a satellite moves very quickly through a large range of areas, a balloon stays relatively stationary. This permits the researchers to determine whether what they observe is related to the location of its observation or the time of the event. Millan emphasized the academic value of a balloon-based project, which has a slower timetable than a satellite mission. The extra time lets students take a more active role in the work. They build the equipment, receive the results and analyze the data within the time frame of an advanced degree program. Also on the X-ray payload is what is called a “piggyback” experiment, using space and weight within the allowed limits but unused by the primary research. NASA is testing shielding materials for space vehicles. Some payloads have been “fried” by the solar energy, which can be absorbed into the payload vehicle and cause overheating of components. Airplanes are flying and weather reports are coming in. Making it all possible are a small group who have their feet firmly planted on the ground. Behind the scenes of the weather and air-traffic-control operations in Antarctica is an unsung team of electronics technicians who keep all the equipment running properly. They’re part of the Aviation Technical Services contingent in McMurdo Station. Led by Mike Rugg, the team has two major elements. Out at the airfield, there are the “Ice Elecs,” who keep the radios and navigational instruments working for the proper operation of the airport. They also maintain the weather equipment that records conditions at the runway, which often differ greatly from the situation in town. And in MacTown, there are the “Mac Elecs,” who work with the air-traffic-control and weather instrumentation here and across the Ross Ice Shelf. “It’s probably the best job on the continent,” said Jon Shields, the supervisor of the team in town. checked in a number of nearby locations. Shields likes being able to choose where he’ll stop by next. Like a lot of material in Antarctica, the equipment isn’t necessarily all that modern, but it’s functional and durable, which is more important. A few years ago, one team’s members invented and built an instrument for the air traffic control group. There’s no book for it, and no spare parts. But it’s still working. Even for things which do have manuals, the parts occasionally aren’t handy. Technicians sometimes have to look at the spare bits and pieces they have lying around and make repairs with them. In addition to repairs, the electronics technicians have recently been installing automated weather stations around the Ross Ice Shelf to help meteorologists measure and predict weather at McMurdo and the airfield. between 60 and 90 minutes, since they’re installed in snow. In preparing to move the airstrip from the sea ice to Williams Field, the runway technicians have been setting up and testing the navigational aids pilots need to land and take off. “Things have been going pretty well,” said Larry Lainey, the team leader at the runway. Lainey is happy that they now have two control towers and two navigational beacons. It means they’ve had a spare of each this season, and will have a spare when the move to Williams is complete. But the crucial difference, Lainey said, is that they can have both runways fully functional at the same time when the move is taking place. In previous years, they’ve had to take down the control equipment at the sea ice runway, move it to Williams, and set everything up again. Now they can set things up at Williams Field ahead of time and be ready when the move happens. Weather is a factor in this, too. While the buildings are being dragged to their new location, they have no heat. This can cause problems trying to use the equipment right away in the new site. “Electronic equipment works a whole lot better when it’s had a chance to warm up and get to a stable temperature,” Lainey said. The electronics technicians have an unusual job, in that if they do their work properly, nobody knows they work; all the instruments just run well. But when things go wrong, they’re the ones in demand. Usually things work well, but it’s rarely just one piece of gear which goes down at a time. “Everything breaks at once,” Shields said. But then, usually, it gets fixed quickly and the technicians can return to maintenance, upgrades and new installations. Attention aircraft over Antarctica: this is where to report. Passengers and crews on U.S. planes and helicopters anywhere on the Ice rely on Mac Center for safety and information. When things are going well at McMurdo Station, Mac Center is hopping. Helicopters and fixed-wing aircraft over much of the Antarctic continent are controlled from a small room in Building 165. When things are going badly, the search-and-rescue team gathers here, as does the mass-casualty response team. But most of the time, work at Mac Center is about air traffic control. Three thousand square miles of area, from sea level up tens of thousands of feet, are kept in order at Mac Center. And without radar, the controllers have to keep a mental picture of this huge region in their brains. There are large areas of Antarctica which don’t have air traffic control, but the people in Mac Center have to keep tabs on those areas as well, since many of the planes crossing the continent fly through its area of control somewhere on the flight path. brush the edge of Mac Center’s responsibility range. Juggling radios, telephones, and pencils, the people who work in Mac Center track everything, in their heads and on paper. There are route-checkpoint forms, radio-contact forms and weather updates which shuffle past the control desk. “You have to do all this for each plane,” said air traffic control manager Dave Ferguson, gesturing at a set of papers including a long form with spaces for weather conditions, time, and flight direction, among other data. It’s not self-contained. Telephone calls have to be made to Auckland when planes fly across 60 degrees south latitude, the northern boundary of Mac Center’s responsibility area. Pilots and controllers depend on reports from Mac Weather, the field camps and aircraft in the air for flying condition information. Tapes are rolling the whole time, too. They’re used for quality control and for training, as well as providing backup in the event of an emergency, so investigators can try to piece together what happened. Even when most of the planes are on the ground or out of Mac Center’s airspace and things are a bit slow, it is not the time to slack off. Someone might radio in any minute, needing information or help. Mac Center stands by. Does the water in the sink, toilet or tub spin down the drain in opposite directions in the Northern and Southern Hemispheres? If so, why? You probably learned about the Coriolis Effect in high school or college science classes. This effect, caused by the rotation of the Earth, does mean that weather patterns and ocean currents spin counterclockwise in the Northern Hemisphere and clockwise in the Southern Hemisphere. when the water is very still prior to draining. In reality, sinks and toilets drain in either direction in both hemispheres, depending largely on the designs of the basin and direction of flow of the water toward the drain. What’s the coldest temperature recorded in Antarctica? The hottest? The highest wind speed? Coldest: -129 F at Vostok on the polar plateau, on July 21, 1983. This is also the world’s low-temperature record. Warmest: 59 F at Vanda Station, Scott Coast, on January 5, 1974. Commonwealth Bay region of Adelie Land the windiest spot on Earth. The mean annual wind speed is 50 miles per hour and maximum measured wind velocities exceed almost 200 mph. A thousand years ago, some Europeans feared the world would end with the first millennium. Now, at the close of this millennium, concern has spread to all levels of societies around the world. Some people say the end is near. Others seem less alarmed but forewarn of gas, cash and other shortages as people hoard supplies they fear will become unavailable. In Antarctica, and in our support structure back in the U.S., there is relative calm. While it’s likely that there will be problems in some areas of the world where technology lags, the U.S. Antarctic Program has spent over a million dollars since 1997 to ensure that the remote, resource-limited stations in Antarctica will not have problems. “Basically anything that plugs in or has a battery backup was assessed in some way,” said Beth Bradley, ASA’s Year 2000 project manager. While many people are concerned about computers, Bradley said, they are not the primary concern with the Antarctic program. The problem is caused by confusion in pieces of electronics which have internal clocks. If they fail to properly recognize January 1 as the year 2000 and not 1900, problems could arise. In addition, the fact that next year is a leap year compounds the issue. With power plants, a TV and radio station, medical equipment, and science equipment, as well as the research vessels and the ubiquitous GPS units, Antarctica is a very technology-dependent place. “We have more than most companies,” Bradley said. It is perhaps a blessing, then, that some of the equipment in use is so old. Korean War-vintage radios, for example, have no internal clock, and thus aren’t expected to have any problems, Bradley said. One problem area Bradley didn’t anticipate was the monitoring system on the heat traces, which warm the outdoor utility pipes at McMurdo and the Pole. If it hadn’t been fixed, the monitoring computer would have failed, potentially freezing all of the pipes at both stations. It’s not just equipment in Antarctica which was scrutinized. Also examined were the resources of organizations with which ASA and NSF work. The Air National Guard, Aviation Technical Services, the U.S. Coast Guard, vendors and suppliers of equipment, and subcontractors, as well as the New Zealand and Chilean governments, were all checked for potential problems. “If anyone thinks of anyone who touches our system in any way I’ll call them and talk to them,” Bradley said. The computer systems have also been thoroughly checked. Some equipment has been replaced, according to McMurdo computer supervisor Scott Ferguson. Some software has been upgraded or replaced as well, Ferguson said. Protecting network operations is most important, and involves the checking of all computers that arrive at McMurdo. “Before it gets attached to the network we test it,” Ferguson said. E-mail and telephone connections are made via satellite link directly with stations in the United States. Ferguson does not anticipate any problems with those connections. E-mail from Christchurch takes a long route through a number of connections on the ground and in space, but Ferguson is confident those connections will remain intact. Ferguson also noted that there are multiple methods of communication available. If telephones, for example, do not function properly, radio and e-mail connections will still be possible. Across the board, Bradley said, equipment has been upgraded or replaced. The project has also required a careful inventory of all items in use throughout the program, which was never fully done before. “It’s really forced us to update and take a closer look at what we have,” Bradley said. “We continue to test and retest,” Bradley said. Fifty people will work overnight on New Year’s Eve to monitor equipment and make sure everything goes smoothly. A team in Denver will be awake early to support the Christchurch offices, Pole and McMurdo. The team will then wait for the new year to turn at Palmer Station and in Chile. Denver’s own new year will come next, and then an hour later Port Hueneme will head into the year 2000. Only then will the Denver team be done for the day. interruption to science research or support. The shades are on, the radio’s playing NPR and she has a big grin on her face. It’s just another day driving the ice runway shuttle for Betsy Johnson. She crosses the sea-ice transition more times a week than most people do in a season, piloting a huge orange van with massive wheels through the lumps and bumps where the frozen ocean meets the land of Ross Island. In the van with her are the people and parcels going back and forth between McMurdo and the collection of buildings at the ice runway. Sometimes the van is full, sometimes she’s the only one, but Betsy doesn’t seem to mind. She is, after all, in Antarctica. “Where else could driving in circles be more exciting?” she asked. It’s the sort of question which defies an answer, but at the same time explains why so many highly-qualified professionals–Johnson is a physical therapist–take Antarctic jobs they’d never do at home. This isn’t the first job she’s taken because of the location: Recently she worked as a driver for a cruise line in Alaska, giving passengers tours of areas where the ships docked. She and her husband, Bryan, who works at Air Services in McMurdo, plan to work for the same cruise company again when they get off the Ice, on a working trip from Sydney to Bangkok. But for the moment, Betsy’s working on winning a bet she made with one of her passengers: that she wouldn’t be smiling at the end of the season. She said she would make it, and her smile is still greeting everyone who scrambles up the metal step into the van. She picks people up around town, and often goes the extra mile and drops them off at their final destination–instead of Derelict Junction. Most people do get on at the shuttle stop there, between Building 155 and the dorms. But if they’re injured or carrying heavy things, they get picked up. Besides the transition, where she concentrates on keeping the van from bumping around too much, Betsy keeps up a running conversation with whomever happens to be along for the trip. It’s a good-natured banter, and keeps her in touch with a lot of the goings-on as they’re happening. It’s not the most adventurous job in town, she admits, but she gets to meet lots of people as they go to or from work, or travel out to do small repair jobs at the ice runway. “I’m doing pretty well remembering people’s names now. It’s tough. They all know me, and they get in all bundled up, with their sunglasses on,” she said. Every now and then a bit of adrenaline kicks in. A few weeks ago the vehicles at the ice runway were gathering to convoy back to town before the weather got bad enough to prevent them from making the trip. With the wind worsening and a big line of vehicles in need of a driver to go first, Betsy, in the first few weeks of her first season on the Ice, started the long, slow drive from flag to flag, 3 miles back to town. The convoy made it safely back. And sometimes a more relaxing event occurs. “Every once in a while, we’ll see some wildlife,” Betsy said. She’s seen seals and penguins along the road and at the ice runway. She and her passengers also get to see incredible fata morgana. She’ll stop and let folks get out and take a few pictures if there’s time. Betsy always has her own camera with her, and will often take pictures if there’s something spectacular to see. She’s always on the lookout for fun on the trip. But even when there’s not much to be had outside the van, she always waves as passengers pile in, merrily greeting anyone who needs a ride. Flying into Marble Point there’s not much to see from the air. It’s about five buildings, dwarfed by fuel tanks. It’s all tucked away into the loose gravel of a spit of land between the glacier and the sea. But upon exiting the helicopter, you discover another world. A man waves and shouts hello from across the landing area. Even the fuelie smiles as she drags a hose toward the thirsty vehicle. A woman waits in the warm house, ready with hot chocolate, tea, and coffee. They are James Raml, Meg Flanagan and Diane Bedell. They are the real Marble Point. McMurdo’s still the big town, but this is civilization, Antarctic style. Helicopter pilots know Marble Point well. They fly into and out of the Dry Valleys through the area. The Cape Roberts pilots also stay here, on the west side of McMurdo Sound, to be able to fly the morning shift change even if there’s weather in McMurdo. For four seasons, he’s been the site manager, the telecommunications technician and general handyman. If it’s been built or repaired around Marble Point, he’s worked on it. There’s almost nobody else, and not much in the way of materials. He took a Wannigan structure when Williams Field got rid of it. It was leaning over and pretty well beaten up. That was a couple of years ago. Now it’s upright, with a new floor and a new coat of paint on the inside. It sleeps eight and includes a furnace that’s as clean as a new one. All of that was done with materials left over from other projects, including work done at McMurdo or the South Pole. There’s always more to do. Among the tasks: Cleaning up the site from decades of messy Antarctic operations, getting cargo ready for transport to the Dry Valleys, getting waste and cargo ready to return to McMurdo, and then–oh yes–the normal stuff to support life. Even in just a short 10-minute tour of the place, Raml comes up with a list of about a dozen things he intends to work on now or in the future. “Every year I try to get a few things done,” he said of his “spare-time” projects. In addition to helping Raml with the cargo and life-supportjobs, Bedell makes sure the guests are at home in their well-maintained surroundings. “We try to run it basically as a bed and breakfast,” she said. hold, and is the weather observer, medic, and doer of anything Raml doesn’t do–except fuels. She is very relaxed, though, even with all that on her plate. She’ll sit with you and talk if you’re in the mood, or let you be. Raml and Bedell make an excellent team. They have anywhere from one to 12 guests on any given night. The camp can sleep 17, and while the table is not quite big enough for everyone all at once, there’s plenty of room for eating in shifts. The other member of the team is the refueling technician. Fuelies rotate every three weeks, which is a nice break from town, but is no picnic. Helicopters fly 24 hours a day for large portions of the season, and there’s always another one coming in. It means all three are going all day long, stealing time “off” whenever there’s nobody visiting and no helicopter on the way. The beautiful setting is just part of the payoff for being the first field camp put in each season, and the last to be pulled out. For all of them, it’s the appreciation on visitors’ faces when they realize this is a special place and that they’re as welcome as can be. Three miles out onto the sea ice from McMurdo Station, a few small buildings are clustered together in two rows. Radio antennas are perched atop rooftops; vehicles come and go constantly. Bulldozers and graders clear runways, roads, and loading and fueling areas. 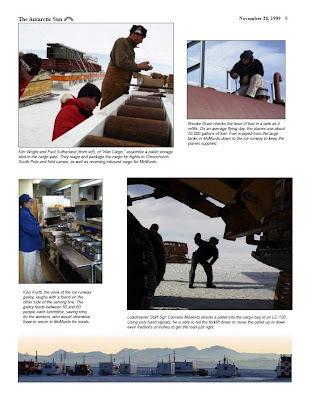 As the staging area for cargo and passengers coming to and from Antarctica and moving around the continent, the ice runway (and later in the season, Williams Field) is a vital area for successful seasons at McMurdo, South Pole and the field camps. It’s easy to think an airport is just about pilots and air crews, but there is much more behind the scenes. People who don’t fly at all have key roles to play in the process. Is there lightning in Antarctica? Jeff Prucinsky of Mac Weather reports, “I do not believe that there has ever been a recorded case of lightning in the Antarctic.” The reason is that lightning requires clouds that are tall enough to have large areas of positive and negative charge. Because Antarctica is so flat and white, there is little convective activity, and no chance for clouds to form high enough, Prucinsky said. With no tall clouds, there is no lightning. How did Amundsen and Scott know when they had reached the South Pole? path of the sun across the sky, Amundsen’s and Scott’s parties were able to determine their latitude. Longitude was of no concern, since longitude is meaningless at the poles. As well, Scott knew he was at the Pole because he found a Norwegian flag planted there. Why is a Jamesway called a Jamesway? these ideas, or know of other theories, please contact us at the Sun. It’s the deepest bedrock hole in Antarctica. When the drilling at Cape Roberts stopped for the season on Thursday the hole was 3,084 feet deep—more than 650 feet farther than the previous record. The two drillers, Malcolm MacDonald and Frank Tansey, took turns being the most important men in the Cape Roberts Project: the men who made sure the core kept coming up out of the hole and into the hands of climate researchers. The drillers, though, couldn’t do anything without a lot of help of all kinds. The 40-person support and science team at Cape Roberts works around the clock, which makes for some odd situations. “It seems a bit strange to see people in here having a beer at 8:30 in the morning, but it’s their night time,” said Colleen Clarke, who runs the camp during the day. Pat Cooper, the drill site manager, has been working in Antarctica since the early 1980s. “The ‘Antarctic factor’ down here has a lot of influence on our drilling,” Cooper said. Among the challenges this year was an April storm, which broke out some of the sea ice near where the drill site was planned to go. In August, a team flew down to check out the area and set up the camp. “We didn’t really know for sure what was happening until we got down here at Winfly,” Cooper said. But things looked good, and they decided to drill this year. Now the project involves over 60 researchers and support staff. “It’s a mix of technology and science objectives,” said Peter Barrett, a member of the project’s management team. A 60-ton drill rig sits on the sea ice, supported by the strength of the 8-foot-thick ice and under-ice balloons, which give an additional 11 tons of lift. A 5-inch pipe, called the sea riser, provides the conduit in which the drill passes through the 980-foot-deep sea water. It must be freestanding and self-supporting to work properly. Suspending it from the sea ice only forces the ice to support more weight. “It has to be totally independent of the systems up here,” Cooper said. But it is impossible to stand a 980-foot-long 5-inch pipe on its end without help from above. The pipe is sunk 30 feet into the sea floor and is supported at the middle and the top by air bladders which pull up on the pipe to maintain the pipe’s rigidity and prevent it from bending or buckling too much. They also have to deal with the movement of the sea ice itself. Under current conditions, the ice can move nearly 60 feet in any one direction before the angle of the drilling equipment will prevent it from working properly. “To date we have moved off 6 meters (20 feet) from where we spotted in,” Cooper said. The project has had the same drill crew for three years, which has made things easier every year, according to science coordinator Peter Webb. When the core comes out of the hole, it begins a journey which will move it faster and further than ever before in its 40-million-year history. It is removed from the core pipe and goes to the lab at the drill site for preliminary examination. The core is examined, scanned, tested for physical properties, and split into an archive half, stored safely for the future, and a working half, from which samples will be taken at Crary Lab. The working half is scanned again before the core goes on the helicopter to the camp and Crary. At $10,000 per yard of core, it’s worth a little extra time to photograph and scan everything in case of a helicopter accident or other disaster. Some samples of the core are extracted at the drill site lab, to be used to determine more about the characteristics of the rocks being drilled, as well as to attempt to approximate an age for the rock layer. The research is not just on the core itself, though. Some researchers are using the availability of a deep hole through many layers of rock to study the rock in situ. Christian Buecker is one of these scientists. He does what is called “down-hole logging,” sending instruments down the hole to collect data about the rock around the hole, at intervals of a tenth of an inch. logging run, Buecker had been awake for 44 of the previous 50 hours. “We are looking for the physical and chemical properties,” Buecker said. The data gathered helps them understand the core better, as well as the surrounding rock. “It partly confirms our information and gives us new information about the structure,” Buecker said. Among other things, Buecker has learned that the temperature at 2,500 feet down the hole (below the sea floor) is 68 F. It increases as they get closer to the center of the Earth. But 3,084 feet is as close as the project will get to the Earth’s center. But in terms of both science and technology, this is not the end. Camp manager Jim Cowrie has put in a proposal to the member countries of the Cape Roberts Project to set up a consortium of Antarctic drillers and researchers who use drilling as a method of gathering data. sediment below, to see what was happening in the center of Antarctica. But even this work, in which the margins of the ice sheet are being studied, has been fruitful. When Peter Webb left Antarctica in 1959, he thought he’d never be back. Not only was he wrong, but he’s now in the middle of his 20th season on the Ice. to the Ice in 1957 on a U.S. ship as a cargo handler. With a friend, Barrie McKelvey, accompanying him, Webb was quickly snapped up by New Zealand and U.S. field parties for the International Geophysical Year (IGY). Both countries’ expeditions were long on geophysicists but short on geologists. Webb spent the rest of that summer season in the field. The following summer he returned to continue research associated with the IGY, and became one of the first people ever to explore the Dry Valleys. Webb himself corresponded with and ended up meeting some of the geologists from Scott’s and Shackleton’s expeditions, who were still alive in the late 1950s. “We headed inland to all the places they could never go,” he remembered. Webb said he feels like he falls between eras. His first year in Antarctica was only 40 years after the age of the early explorers. His four decades since have centered on the scientific exploration of the continent. “I often feel caught between those early expeditions and the present day,” he said. The first part of that gap he bridged in U.S. helicopters over the Dry Valleys. The best maps they had were from early expeditions, which were closely tied to the coast and their supply ships. “It was a very strange sensation to be holding a 1910-11 map on your knees in a helicopter in 1957,” Webb said. The maps weren’t all that complete. To find their way back to McMurdo, the pilots climbed in circles until they saw Erebus and headed that way. They had no other way of knowing where they were. The Dry Valleys were so remote then that the only time Webb saw a helicopter was when it dropped him off and when it picked him up. Between those times, Webb and three others spent their time walking. They set up two base camps, at Lake Vida and Lake Vanda, and “radiated out from there,” Webb said. They would carry supplies to outlying camps and then take day trips from those sites. They would climb high points and take photographic panoramas, which could later be patched together into maps. “We were doing reconnaissance, mapping, and geology,” Webb said. Once a week they would make radio contact via Morse code, relaying only the most basic information. “We could have been dead six days and no one would have known,” Webb said. They ate surplus Korean War military rations and pemmican, and had a hard time heating water. “It was all very primitive,” Webb said. back to the nearest base camp—making several trips per day if necessary. “One season we calculated we walked 1500 miles,” Webb remembered. His feet aren’t worn out yet, and over 40 years later, he’s still coming to Antarctica. Now he’s the science leader for the Cape Roberts Project. One of Webb’s former students now has a graduate student of his own; all three are members of the Cape Roberts team. The exposure to new possibilities has just appeared again, with the discovery of fossilized wood in the Cape Roberts core. “This is a serendipitous environment,” Webb said. When planning research here, he allots 20 percent of the time for things he doesn’t yet know about. He’s also impressed by the people who are here now. “Back in 1957 the people who were here didn’t have a lot of interest in the place,” he said. There was a time when Antarctica was something most people didn’t know anything about. Disinterest in the early days was such that students in his classes who had spent time in the Navy would see his slide shows, recognize places they’d been, but not even known they’d seen Antarctica. “People would come up after class and say, ‘I think I’ve been to Antarctica,’” Webb said. Now, though, the people here know a lot about Antarctica. “The level of education amongst the total current population is pretty good,” he said. He is interested in seeing what happens to McMurdo as a community over the long term. “It’s unusual to take a group of people who don’t know each other and put them in this remote environment,” he said. In a small office in Crary Lab, talking to satellites is more common than talking on the phone. From the outside, it looks like any other office—except for the NASA sign. Inside, the people call it the McMurdo Ground Station. “We’re the only ones down here that can actually see satellites from this part of the world,” said Chuck Seman, a member of the team sent down by NASA to provide satellite communications service. They work with U.S., Canadian and European satellites in coordination with a network of ground stations in Alaska, Norway and Virginia. The network monitors satellites on what are called polar orbits—the track circling the earth from pole to pole. Most of what the McMurdo station does involves making sure the satellites, or “birds,” are still working properly. Data is usually transferred earthward from the satellites in the Northern Hemisphere, because of better access to high-speed communication links. The technicians at the ground station are a vital link in the satellite support process. For some satellites, the process at McMurdo begins even before launch. In those cases, they track rockets from the launch pad through the point where they release the satellite to fly on its own. In most cases, though, the office gets a list of satellite contacts to make. Most links last between three and 15 minutes. The connections involve incredible feats of behind-the-scenes electrical engineering. It takes a lot to track a satellite more than 400 miles high, moving so fast it circles the Earth every 90 minutes. On the ground at McMurdo, computers and engineers are moving a dish antenna 10 meters wide in a huge arc to follow the satellite. At the same time, they’re receiving data at rates up to 105 megabits per second—about 3,000 times as fast as the average home computer modem. One of the tasks that keeps McMurdo Ground Station busy is an upcoming rescue mission for a satellite that has its solar panels pointing the wrong way. Its owners are hoping that the sunlight bouncing off the ice cap will power the satellite enough to move it into proper position. The station will attempt to contact the satellite and then be a bridge between it and the satellite’s controllers back in the U.S. It’s not a regular task, but neither is it unheard-of. “We tried that before ... it failed,” Seman said. There are two other major projects on the calendar at the moment. The first is a new 13-meter dish, which will be arriving on the resupply vessel this summer. It will help the U.S. government get 24-hour weather coverage worldwide. It is unclear at the moment how that will affect the six-hour satellite blackout Mac Weather has each day, Seman said. The second project is another Antarctic mapping project like the one which just finished, in collaboration with Canada’s RADARSAT satellite, gathering high-resolution images of the Antarctic continent even through cloud cover. “We’re the only project down here year-round,” said technician Jaime Gallo. A lot of what goes on in the office is monitoring and preparing equipment to do the work. This can involve repairing equipment, manufacturing new parts from old machinery in storage, or just making small changes to the process to weed out potential problems. “We’re not beakers, we’re like tweakers,” Gallo said, laughing. It’s a blue-sky day out on McMurdo Station’s ice runway, but the world’s turned upside down in the tower. “Planes fly north to the South Pole,” air traffic controller Heidi McCaffray said, watching the aircraft head between Black Island and White Island. Here, that statement makes sense. Close to the magnetic poles of the earth, navigation by compass is unreliable at best and dangerous at worst. Navigation is by “grid,” based on calculations involving the longitude of a current position in relation to the 180-degree longitude line, explained air traffic controller Robert Virgil. Since McMurdo is so close to 180 degrees of longitude, “grid north” is very close to true south. to keep straight not only the type of aircraft on the radio, but also its direction— in real space and on its map. That’s may not seem too tough at an airport which deals with only about a dozen different planes all season. But it’s not all that easy. Runways are busy places, even when there are no planes around. Surveyors are out on the runway checking the sea ice movement, snow plows are keeping the path clear, maintenance workers are checking lights and navigational equipment, and the decelerometer crews are measuring the braking qualities of the ice. Any time a plane comes near, to take off or land, the tower clears the runway of all people and equipment and calls out the fire department’s crash vehicle in the event of a mishap. It’s all done by radio, and largely without the aid of tower radar, except in bad weather. Then the machine in the downstairs closet goes to work. It’s the pilot’s eyes, connected to the airplane only by the voice of the tower controller, every five seconds during final approach in bad conditions. Of the 15 controllers on staff, two are on duty at any given time. Sometimes there are more, if they’re training or checking equipment. There’s a bed in the tower, too, in case the controllers get stuck at the runway. They don’t go home until all the planes are in. There’s also a weather person in the tower, taking readings on the instruments outside and observing conditions on the sea ice. Sandra Lorenzana, one of the tower’s rotating weather crew, said she does hourly observations as well as special reports and more frequent full reports if the weather is changing rapidly. These are called into Mac Weather and Mac Center, she said, to assist them in determining severe weather conditions and informing the pilots of what to expect during approach and landing. arrive on schedule. Now, with an extra tower (which is presently at the ice runway, just next to the operating tower), Williams Field will be up and running with fewer delays. It’s almost the year 2000, but in McMurdo Station’s Crary Lab it’s closer to 40 million years ago. The Cape Roberts project, in its third year of research, is still in search of layers of rock laid down during the Eocene Epoch, 35-55 million years ago. Cape Roberts is about climate change. Right now, climate pattern forecasts are made with only a few centuries of data. Cape Roberts researchers hope to add many million years to the known body of climate data. But this is not Mac Weather’s afternoon forecast. Knowing how climatic trends have evolved over massively long periods of time can help predict what the climate will be like in coming centuries. In this search back in time, they are looking at material drilled from beneath the sea floor. This seabed core was drilled to a depth of 1968 feet on Friday. The drill site is at Cape Roberts, about 75 miles northeast of McMurdo, just south of Granite Harbor, in the southwest Ross Sea. it to the question of climate. At the same time, they’re taking advantage of this rare opportunity to look back in time to further their own studies. The daily schedule in Crary is a mix of routine and adventure. They begin each day by doing a basic classification of the core which arrives late each night from the drill site. In the middle of the morning they report to each other on research progress. “With a project like this, with so many specialists, you have to keep informing each other,” said project coordinator Peter Webb. share time and space well, and are good-natured about their interactions. After lunch, the specialists look at the core which was explained in the morning. Each sample is taken for further analysis. Paleontologists look for fossils in their samples; scientists studying the magnetic field of the earth look at the alignment of particles in their samples; sedimentologists and stratigraphers look at the layering in the sediments. When the samples have been analyzed, the scientists come back together to discuss what they’ve found. the scientists then match up with similar climate sequences from the rest of the world. Antarctica is a special place for doing this type of work because it was the heart of Gondwanaland, the supercontinent from which all landmasses on earth eventually broke off and slowly moved to their current locations. magnetic field pattern is within the Cape Roberts core, they can match up core sections with periods of time. After all this work, they learn what the climate was like millions of years ago. But, just as in high school, no science project is complete without a written report. Formal academic science publication can take a long time, sometimes even years. Submission to journals, review, and then actual publication are all both bottlenecks and opportunities for verification of results. publication to the Ice. Terra Antartica (sic) is an Italian earth science journal which publishes the results of the Cape Roberts Project team. An editor and a graphic artist for the journal are here at McMurdo working full-time to prepare the scientists’ work for release to the wider community of world climatologists. final science report, which is also published in Terra Antartica. Less than a year after they begin a season of drilling, the results of research and examination are available to the science world. What these results reveal is of great import to determining climate change trends. average temperatures, plant and animal life, and other information are contained in the core, a cylinder of rock just a few inches thick. The Cape Roberts Project is a multinational collaboration, in which the U.S., New Zealand, and Italy are the major shareholders (and major funding sources). Also participating are Australia, Germany, and the United Kingdom. The project is going well, in its third and final year of drilling. “Cape Roberts is successful,” said Italian researcher Marco Taviani, speaking of the time and energy spent, as well as the money and international collaboration efforts. Wellington's Stokes Valley begins at a busy motorway and ends at a bush-covered ridge. The only sign there's anything up there besides the requisite possum horde and occasional pole house dweller is a white and gold spire rising 10 metres out of the trees. A string of fluttering prayer flags stretches from it to a hidden anchor point away from the possums' sharp teeth. It's the yellow AA road sign - "Buddhist Monastery" - in a quiet cul-de-sac that directs seekers of truth and tranquillity up Rakau Grove to a giant wooden gate and behind it, Bodhinyanarama, the garden of enlightened knowing. Beyond the gate is a scene of unexpected exertion and industry: two men - one shaven-headed and in saffron robes, the other in jeans, a T-shirt and gumboots - building a set of dirt-and-log stairs up a bush-covered hill. The monk, Sucinno, directs the visitor further up the hill to see the near-completed stupa, or reliquary. Numerous relics and treasures, gifted by Buddhist faithful, will be enshrined in the stupa to help the donors on their journey to enlightenment. Donations to Bodhinyanarama are generous and by no means limited to special projects like the stupa. The monks are not allowed to cook food or to take anything which is not freely given; so in exchange for the laity's support in worldly things - clothing, shelter and food - the monks offer guidance along the path of the Buddha. It is part of the Buddha's design for an ideal society, with interdependence between laity and monks and nuns. New Zealand's Buddhist community numbers nearly 30,000, and it is this web of support that keeps Bodhinyanarama's four monks and one postulant supplied with food, clothing and special projects manpower. The monastery also hosts retreats and classes on meditation, Buddhism and other spiritual activities, paid for by donation to help cover the cost of lodging and food. Once a month, a monk travels to Auckland to meet people at the city's Buddhist centre. There is also a retreat centre on the Coromandel peninsula and other meditation centres throughout the country. Anyone can park their preconceptions at the gate and hear the monks explain the principles of Buddhism - a religion "without a god" founded more than 2000 years ago by Siddhartha Gautama (the Buddha) in northern India. In Thailand, where Sucinno was a monk for 14 years, his role seldom called for teaching Buddhist history and tenets. Here, he says, he spends much of his time explaining the Buddha's "four noble truths": all existence is suffering; the cause of suffering is desire; freedom from suffering is nirvana; and the means of attaining nirvana is prescribed in the "eightfold path" that combines ethical conduct, mental discipline and wisdom. A small prefabricated wooden house, built on the coast of Ross Island, home for several Antarctic explorers over a couple of winters. No, not the lowercase dorms, but the Cape Evans hut. The hut was used by two expeditions to the Antarctic. It was built by Captain Robert Scott’s 1910-1912 expedition to the South Pole. The building itself, built from pre-constructed parts, was erected in two weeks. The hut was a base for groups to lay supply depots on Scott’s planned route to the Pole. They also explored the coast of Antarctica. On May 13, 1911, the group settled down in the hut for the winter. The three men, Cherry-Garrard, “Birdie” Bowers, and Bill Wilson, man-hauled sledges 65 miles across sea ice and the Ross Ice Shelf to a penguin rookery, freezing and starving most of the way. After retrieving six penguin eggs and killing several penguins for food, the men broke three of the eggs on the precarious return to their camp at Cape Crozier. But it got worse, and they weren’t dead. A storm blew away their tent, wrecked their stone shelter, and nearly killed them. After the storm, they were lucky enough to find their tent—their only shelter for the return journey. They regularly fell asleep while walking back, frozen and exhausted. Their clothes froze solid, making movement difficult; upon their return to the Cape Evans hut, their clothes were cut off them, too frozen to remove normally. The three remaining penguin eggs survived the journey to Britain, where they languished in obscurity, useless to science and lost to archivists of polar curiosities. A later party also used the Cape Evans hut: part of Shackleton’s famous failed expedition. While the leader and his men were stuck in the Weddell Sea, another group was supposed to lay supply caches between the Pole and Ross Island. They were unable to find a safe place to winter elsewhere on Ross Island, so they used the Cape Evans hut. They thought they had secured the ship carefully for winter, using two anchors and seven steel cables to hold it securely in place. They began to off-load the ship, leaving the main part of the stores on board. Before many supplies could be put ashore, though, a huge storm kicked up and blew the ship out to sea, stranding 10 men on Ross Island—four at Cape Evans, and six at Hut Point. The rest of the group were still on the ship. The 10 men on the island soon joined forces and began to improvise for the winter. Fortunately for them, Scott’s expedition had left a lot of basic stores, like flour. They made clothes out of canvas tents, and began to lay supply depots, unaware of the disaster befalling Shackleton and the others a continent away. Survival was by luck; during the setting up of supply caches, two men became unable to walk, and the others were so weak they only made headway when there was a powerful wind at their backs. Upon their rescue in January 1917, they discovered that the world had “changed almost beyond recognition” between their last word from the outside, in December 1914. To find out about trips to Cape Evans, call the Recreation department at 2443. Steve Bruce has been coordinating the renovations to McMurdo Station’s Building 155 since the beginning of February. Tomorrow, the day the new offices will be repopulated, Steve is leaving town. He leaves behind a major section of the million-plus dollar project, complete except for the finishing touches. The renovation work will continue during next winter, and extend into other parts of the building. Though the improvements to Highway 1—McMurdo’s busiest hallway— are obvious to anyone who saw the area before last winter, a lot of the changes affect more than the appearance. The first stage of renovations saw improvements to the kitchen’s food preparation area. The second phase, gutting Highway 1 and redoing it entirely, was this winter’s work, along with the kitchen’s dry storage, and freezer units, including refrigeration compressors. Bruce called “parka parking,” as well as a handwash station for people to use before meals. “Very nice,” said the first new occupant of Highway 1, hairstylist Kim Fabre. “We’ve made it a little bit our own here with the palm tree,” she said, referring to the decorations already up in her shop. “The walls are brighter,” said recreation coordinator Liz Evenson. Housing is enthusiastic, too. “It’s going to be wonderful,” said Heidi Kampe. durable, as well as more fire-resistant, material. “This was half of the job—maybe the larger half,” Bruce said. And it wasn’t the only thing happening in town. “We had quite a bit of work going on this winter outside of this project,” Neeley said, mentioning as an example the new Cape Roberts core storage facility in Crary Lab. Over a dozen workers took part in the winter project, organizing and using materials delivered on the supply ship Greenwave in February. The staging area was in a small building called the Playhouse. “We don’t have a good large warehouse where you can store stuff,” Bruce explained. Major changes are in the works for the serving and eating areas of the galley next winter, too. The plan is to open out the seating area to the exterior walls, add windows along the walls, and put in a cathedral ceiling—including skylights. Bruce is happy with the way things went over the winter, and is looking forward to his departure for warmer climes. “A good thanks to all the hands that worked on it,” he said. Those crystal-clear blue eyes. They’re the first thing you notice when Forrest McCarthy sits down in front of a group to give his opening lecture at the Field Safety Training Program. One-on-one, they lock on to you and never let go, like a visionary to a dream. It’s been a long journey, through Boy Scouting, on road trips as a Deadhead after high school, on rock climbs in Colorado, treks in Nepal, and beyond. Forrest lives the dream, and made it back to the Ice this season after three years away. Recently, he helped start a program to prevent drug and alcohol addiction among Inuit youth near Nome, Alaska. “The white guy from Wyoming was taking the Eskimos into the wilderness,” Forrest laughed. He even got to make the Eskimos do Eskimo rolls while teaching them to kayak, a traditional Eskimo skill which has been lost over the past couple of generations. He said they were enthusiastic learners, but they had some wisdom to impart of their own. “My background is ‘leave no trace,’” he said, “and these people have been part of the ecosystem for thousands of years.” Modern backcountry methods weren’t the norm for his students. “I’d tell them to filter their water, and they’d just look at me. They’d been drinking it all along,” he said. Forrest has been drinking the water of Antarctic lore for years now. “I remember asking my mother if all deserts were hot, and she found an article in the encyclopedia on the Dry Valleys.” He was about 5 years old at the time, and ever since, has been interested in Antarctica. Over the years he learned more, getting a big picture book for Christmas the year he was 10, and, later, meeting clients in the Tetons who had been grantees on the Ice. He even met Buck Tilly, a longtime sea ice safety instructor, who helped Forrest get an interview for the position at FSTP. He didn’t come back after that first season, choosing instead to finish his college degree in outdoor education with a minor in human ecology. But his return now, older and perhaps a bit wiser, gives him a rare perspective on changes around McMurdo. Also, he finds that people and offices throughout the U.S. program are using the expertise of the Field Safety staff more, for planning routes over sea ice, or scouting potential deep-field landing sites. “We’re being used more as a resource,” he said. But Forrest is not just a nice guy who teaches you how to get along in the cold. A member of the search-and-rescue team, he’s one of the people who will show up in a tracked Hägglunds vehicle in whiteout conditions, pick you up from your feeble snow shelter, and get you warm and dry and home in bed. One day a week, Forrest and his colleagues on the SAR team train. They alternate between practicing scenarios with the primary team and helping to prepare the secondary team for the winter, when they become the primary team. There’s more high-tech gear available to them now, and more experience with the equipment, which Forrest said leads to better training. He’s very happy with the capabilities of the new SAR vehicle, a Hägglunds outfitted with GPS and radio direction-finding equipment, but warns against feeling overly confident in bad conditions just because there’s a great rescue team with good equipment. “It’s an incredibly powerful tool, but it shouldn’t be a crutch,” he said. It’s a lot like your town’s first aid squad getting the Jaws of Life: You don’t drive faster and more recklessly just because they can get you out of the wreck when it happens. Forrest encourages safety, and he teaches people how to practice it in the outdoors. He does so by combining the best outdoor-equipment technology with traditional skills, choosing FDX boots, the government-issue boot modeled on the Eskimo mukluk, and building snow-dome huts with lightweight snow shovels. His Antarctic experience, while broader than most, is still limited to the official U.S. Antarctic Program. He’s never done any commercial expeditions in Antarctica, but has a client who hopes to climb Mount Vinson, the continent’s highest peak. Maybe Forrest will get to help with that trip. Antarctica’s a tough environment in which to live and work, but Forrest still said, “I truly believe the world would be a better place if more people got outside.” He helps make it possible for that to happen safely, even here. Vivaldi was on the stereo. Golden light glowed on the polished wooden walls. The McMurdo Coffee House was warm with cheer and conversation over wine Thursday evening. The recreation department sponsored a wine tasting of six “regional” wines: Australia and New Zealand have excellent wine-producing regions which supplied the evening’s beverage samples. “Six wines to go!” cried one eager taster before walking up to the first of six tables. All the wines found fans in the group, who happily held out their plastic wine glasses for more. The wine tasting itself won great fans. Even a soon-to-depart McMurdo winterer braved the crowd for some quality wine. Liz Muck, from Steamboat Springs, Colorado, is a Merlot fan whose favorite among the evening’s selection was the Villa Maria Cabernet Sauvignon, though she also liked the Delgats Reserve Merlot. She said she was a bit intimidated by the number of people, but was glad she’d come. “It’s a very good idea,” said Christine Foreman, a Dry Valleys research grantee from Toledo, Ohio. Another fan agreed: “I think it’s a great idea; I love wine,” said Kenda Andersen, a construction general assistant from Montana. “It’s fun opportunity for a new person to meet everyone,” said Vicky Miles, a recreation finance clerk from Denver. She didn’t taste all the wines, but while she was busy serving samples, she overheard lots of comments about the wines, among which there was no clear winner. “There was no consensus among the tasters,” she said. Captain John Davis, aboard the Huron out of New Haven, Connecticut, may have made the first landing on Antarctica at Hughes Bay, on the Antarctic Peninsula, on February 7, 1821, on a sealing trip. The next known landing on the continent was at Cape Adare in Victoria Land on January 18, 1895, 74 years later. Jules Dumont d’Urville, in addition to exploring the coast of Antarctica, discovered the statue Venus de Milo and brought it to France. The South Magnetic Pole was east of Ross Island in 1600. It has moved roughly northwest at the rate of 6-9 miles per year, and is now in the Dumont d’Urville Sea. Finns) lived in two huts (called Camp Ridley) at the base of Cape Adare from March 1899 to January 1900. On March 12, 1842, the Erebus and the Terror, James Clark Ross’s ships, collided in a storm in a field of icebergs, crippling the Erebus. Three days later, both ships were repaired enough to continue the voyage. Robert Falcon Scott’s first voyage to the Antarctic, in 1901-1904, began poorly: The expedition’s ship, Discovery, was found to be leaking on the voyage from Britain to New Zealand. all members of the group. (New York: Reader’s Digest, 1988). On the route between Central Otago and the West Coast, the Clutha and the Hawea rivers pose a massive barrier to travellers, goods and animals. They flow together at Albert Town, beginning the chain of confluences which power Central Otago's electric appliances. On the banks of the Hawea River, there is a nohoanga site, one of several in the area traditionally used by local Maori for camping and gathering food on trips from the east coast to the greenstone-guarding glens of the West Coast. Soon there may be a new re-supply site, not just for Ngai Tahu, but for all travellers and residents in the region. Alison and Bruce Hebbard, great-grandchildren of early residents of Albert Town, are planning to build a tavern just south of the bridge over the Clutha. Near where the bridge is now, Henry Ferris Norman, the grandfather of two of Albert Town's current residents, set up the first licensed ferry across the Clutha in 1863. It immediately became a stopping point for travellers and locals. The early settlers were well-known for their hospitality and willingness to help farmers and miners solve any problem that arose. The tavern has the potential to change Albert Town as it will provide the town's first social space where everyone can gather at any time. With a shop and a takeaway/restaurant, Albert Town's residents will no longer have to drive all the way to Wanaka to remedy a moment's inattention at the supermarket. There are some arrangements still to be made. The Hebbards are negotiating with Transit New Zealand over the location of a traffic sight line restriction on the property. The traffic negotiations and the request for a smaller, cheaper building than the one they originally proposed have held up the council's final go-ahead. Worse, the delays mean more delays. There is a time limit on development and subdivision of the property and the Hebbards have applied for an extension, which means more paperwork and more waiting. "We don't like setting deadlines when we don't know if we'll be in a position to make it," Bruce Hebbard said. They have sympathy among the community. "The bureaucracy those people have put up with is absolutely disgusting," said Ida Darling, one of three surviving grandchildren of the first Albert Town ferryman. The residents are impatient for the tavern to get the go-ahead, which is a departure from the usual reaction of small towns to change. Ethel Templeton said: "It would be very good for the area." This favourable reaction from newcomers and old-timers is not just because the people building the tavern are locals, it is because residents see it as a growing, changing area which has opportunity for future projects. Albert Town was once the only town in the district. The first school in the area, though called the Wanaka School, was at Albert Town. The school building once used at Albert Town is now part of the Wanaka Primary School in Wanaka. Three grandchildren of some of the founders of the town still live there, along with some of their children and grandchildren. This is still the kind of place people grow attached to, even if they are spending only small parts of the year here. Tourism is having a mixed impact on Albert Town — there are large numbers of visitors to the area year-round but since there is only one storefront business, there is not much economic impact. The tavern may change that. In the summer, the camping ground across the Clutha from Albert Town fills with holidaymakers from all over New Zealand. Over the past 20 years, one family has perfected the art of summer holidaying by the Clutha. They have a generator, a water pump, a water tank on a scaffold, a wood-fired water heater and a shower tent. They even run a washing machine in the camping ground. The kids have a water slide set right on the river bank. Some of the group don't come anymore: the ashes of two of them are scattered in the reserve, and a tree and an inscribed rock in the corner of the old, disused historic graveyard speaks of the memory of those two and three others. The five names fit neatly on one sone. They are connected in spirit to this place, and to the people who gather here to build their temporary village for the summer, but are only distantly related by blood and marriage. The townspeople may yet adopt the tree (planted there at Christmas 1998) as part of their history, though none but two know about its meaning. Those who live and holiday in the permanent structures don't mix much with those in tents and campervans across the river. But if there is a tavern across the river, they might begin to. Albert Town is a mixed-age down with residents from newborn, to those in their 90s. It attracts the 20-and-30-something set with cheaper housing than nearby Wanaka. The increasing number of lifestyle sections in Albert Town attract retirees and affluent families seeking a relaxed place to live. Others come in search of peace and quiet, a place away from the madness the world can sometimes become. The community association gathers twice a year. Many newer residents are being drawn because their friends and neighbours are long-time town residents, so they feel comfortable in these groups. On weekends, neighbours help with various household and outdoor tasks. There are informal gatherings such as the winter solstice outdoor barbecue hosted by Rae and Ngaire Benfell. The new tavern will provide a purpose-built place for get-togethers. The living room and back garden gatherings will continue but will be broadened by contact with others in town. Albert Town residents share concerns about the future of the town and its services and amenities. Most of them love living here, preferring Albert Town to other places they could have lived and worked. Gary Templeton, who grew up here and is raising his children here, thinks "there's nowhere better to live." Moira Fleming, who has been here for 10 years, agrees. "The people who live in Albert Town love living in Albert Town," she said. Residents are specially concerned about road sealing, sewage treatment and speed limits. As local government priorities change and national governments chance policies and regulations, Albert Town is caught in the resulting turmoil. But the community association is promoting Albert Town's interests in discussions the Queenstown-Lakes District Council has about funding and resource allocation. The separation between the people on each side of the river may subside with the arrival of the tavern. The separation between neighbours and those on opposite sides of State Highway 6, which bisects the town, is also likely to improve. As Moira Fleming put it, "The tavern is a wee hope sign for lots of things." I had left Wellington without a destination. Late at night, in the condition others call "lost" but I call "exploring," my headlights shone upon a massive wooden gate and a sign reading "Bodhinyanarama Buddhist Monastery." It was clear to me that, though I had not intended to end up here, it was no accident. In the morning, the gate was open when I awoke; I dressed and walked up through it. I found two men building a set of dirt-and-log stairs up a bush-covered hill. One of the men had a shaved head, and was wearing golden-coloured robes and sandals. The other had on jeans, a T-shirt, and gumboots. The monk - I later learned his name was Sucinno - told me to talk a walk further up the hill to see the stupa, or reliquary, which was under construction. The walk to the stupa was the beginning of a set of discoveries within myself which I hope will continue for the rest of my life. I had had no previous contact with Buddhism, though I had heard of it and read Hermann Hesse's Siddhartha. So I sat, and listened, and read in the library. I discovered that the Buddha, who was a real person of whom there are historical records, taught four Noble Truths: the existence of suffering, the causes of suffering, the alleviation of suffering, and relief from suffering. His main idea was - and is - that the issues which most concern humans (enumerated as birth, death, aging, separation from the liked, and association with the disliked) all result in, and cause further, suffering in the world. The more I read, the more I was convinced the Buddha had it inside out: life was not suffering but joy; suffering was caused by human imperfection and behavioural flaws manifested in search of joy. The Buddha further taught that Enlightenment, relief from suffering, could be had only by individual searching of the inner and outer worlds. He taught that inquiry and investigation were the way to seeing the world as it truly is, which is how he defined Enlightenment. This involved detachment of emotional ties from people, places, and things. The monks chant, "All that is mine, beloved and pleasing, will become otherwise, will become separated from me." The impermanence of things, beings, and feelings is key in Buddhism. What is is the only constant, and it lies behind the veils of what we think is. I agreed with a great deal of this thought process, particularly in its encouragement to see through the smokescreens we create around ourselves, changing who we are into who we think we want to be, or who we think others want us to be. But I also felt that the push for individualism was a bit overdone. Beyond the basic belief structure, I also had some problems with the lifestyle. There is lots of sitting meditation (2 hours a day), not much eating (only before midday), and an incredibly intellectually rigorous environment (the hard part is figuring out how to ask the many questions which arise). My legs like moving too much, my stomach likes eating too much, and I sometimes need a break from inquiry to recharge my mental batteries. I found a passage in a book by a Buddhist monk, Ajahn Munindo, which said that he felt joy and suffering were inseparably linked; that breaking through suffering resulted in joy. I reflected that none of the thing which had ever made me feel joyous were without a share of suffering at some stage. However, it was not the acceptance of suffering but its rejection which drove me through and beyond the hard parts and, ultimately, to joy. And so the journey continues, with much more to think about than before; I go forth in search of joy.